A bunion is an inflamed fluid-filled bursa formed on the side of the foot. The joint protrudes because the toe is bent away at an angle, pushing into the other toes and causing them to bend unnaturally. Sometimes the second toe is forced over the big toe leading to the toes being crammed together and subsequently, as a result of the pressure, to the formation of corns and callouses. 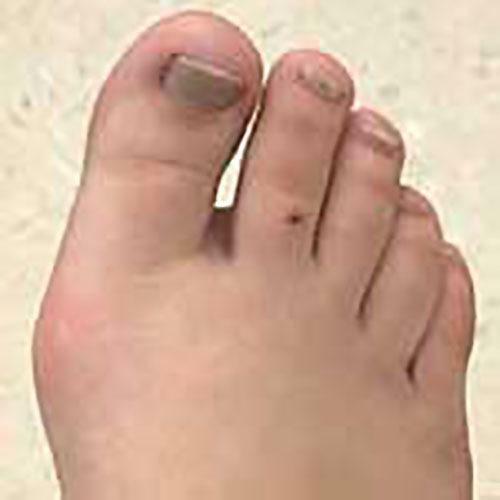 A bunion forms on the side of the foot at the base of the big toe. Bent toes and bunions can run in families but are often caused by defective or ill-fitting footwear. In early teens, bones are soft and still developing and can mould to the shape of the footwear worn. Socks that are too tight or too small, pointed shoes and high heels which cram the toes into the front of the shoe will cause permanent distortion if maintained while the feet develop. A bunion forms on the joint as an attempt to protect against pressure. Wearing a bunion pad or shield which fits the contour of the joint will relieve pressure on the bunion, as will wide fitting shoes. In a small number of extreme cases, surgery can be performed, which involves straightening the toe by removing parts of the deviated bones. 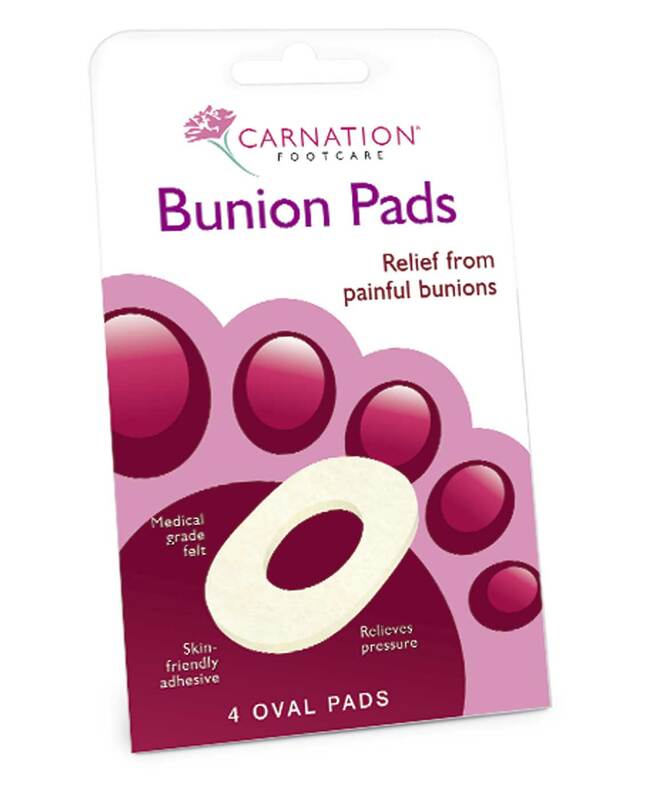 Carnation Bunion Pads are shaped to fit around the bunion and are made from felt, which spreads the load to give maximum comfort. 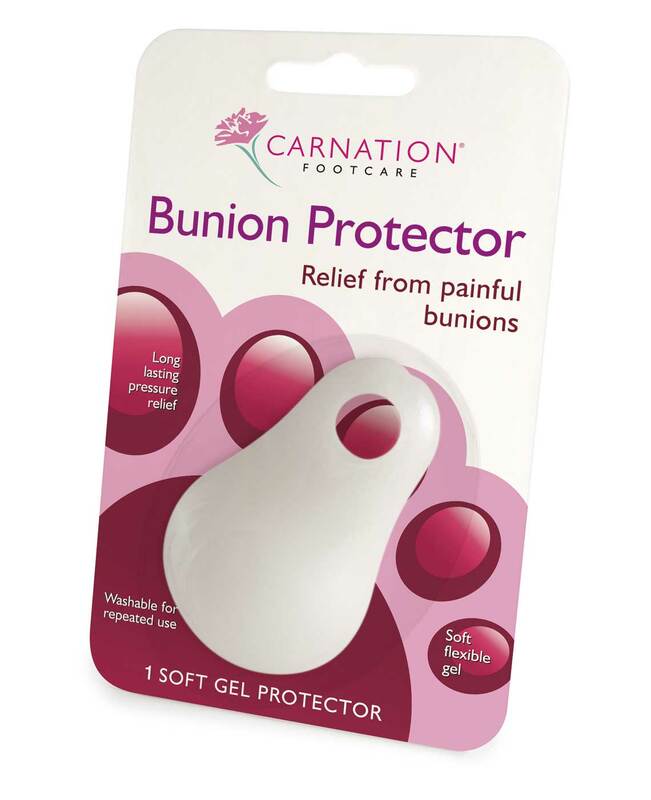 Carnation Gel Bunion Protectors are made from soft, flexible gel with a toe loop to help positioning over the bunion. They can be washed for repeated use.